Yet she is fully seaworthy, to category A of the E.C. 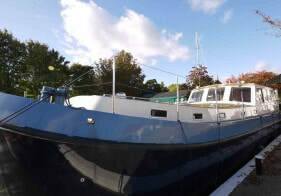 Recreational Craft Directive and can venture much further afield. 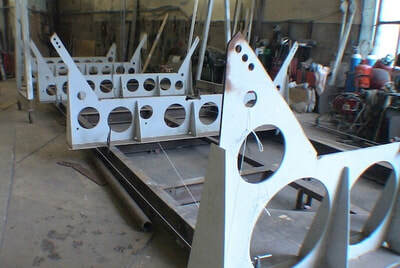 Seen right is a shell ready for grit blasting and epoxy priming. 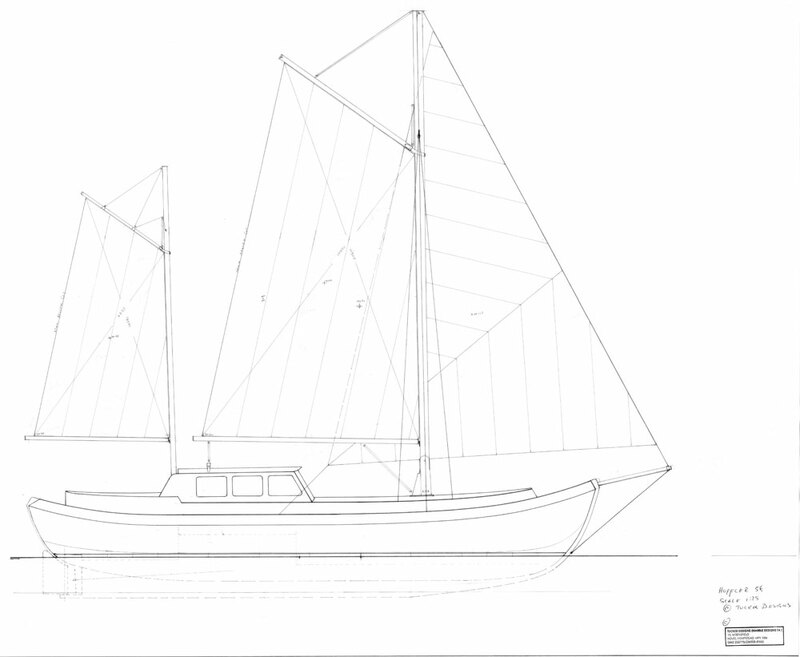 She is available with a drop keel and self-lowered mast, gaff rigged ketch. 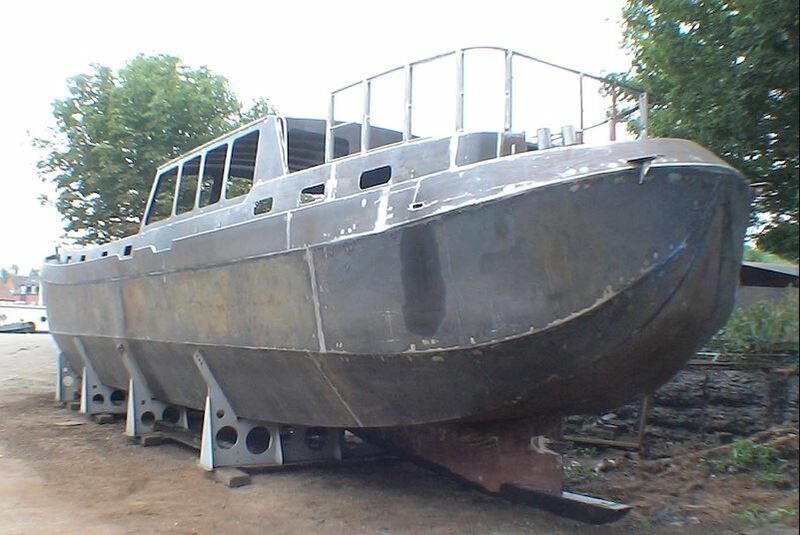 There is a bilge keel version. Click here for sail plan. 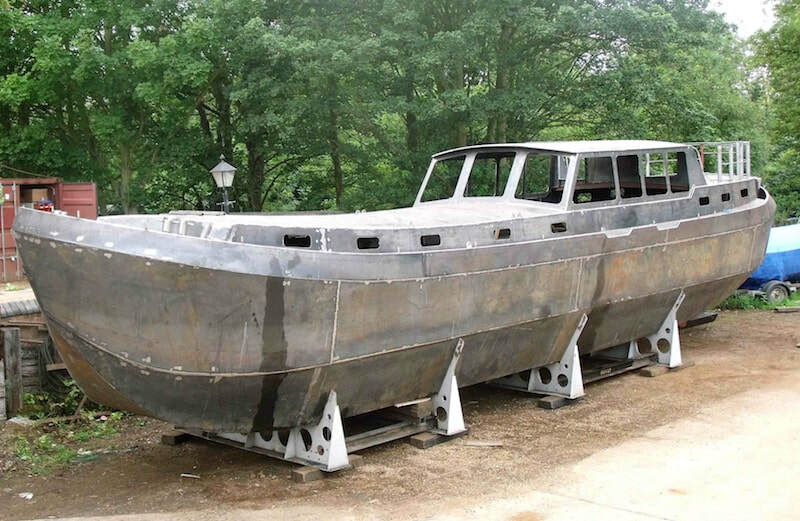 A motor yacht version is available. Dimensions 17 metres by 4 metres. 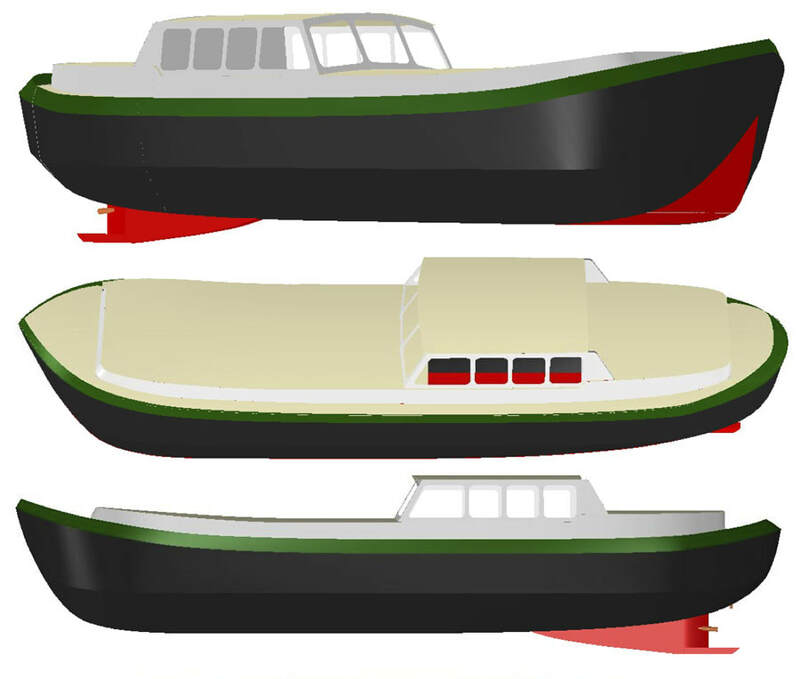 Draft nominal 1.1 metres with keel up to 2.3 metres with the electro-hydraulically operated keel fully lowered. Chined hull in top quality British or N European steel from a known source of origin. There is a large stateroom aft with full ensuite: A large shower to starboard, port hand a roomy WC cabin with washing machine and basin. The walk around king sized double has storage under, lockers and wardrobes to both sides of the cabin. 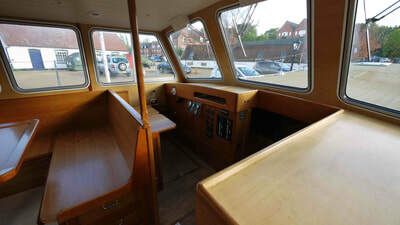 Stairs lead up to wheelhouse saloon with a large U shaped settee and table, double seat helm position and chart table. 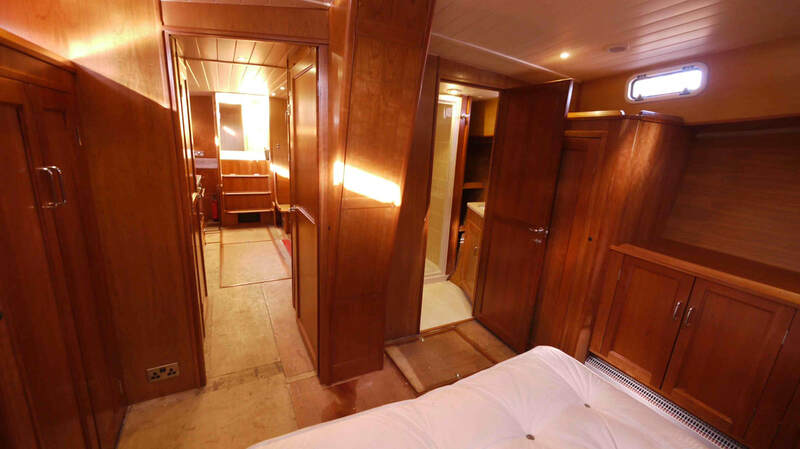 Access to the engine room is down a ladder through a large hatch in the saloon floor. This space gives low access to the engine, generator, central heating boiler etc and even contains a workbench etc. 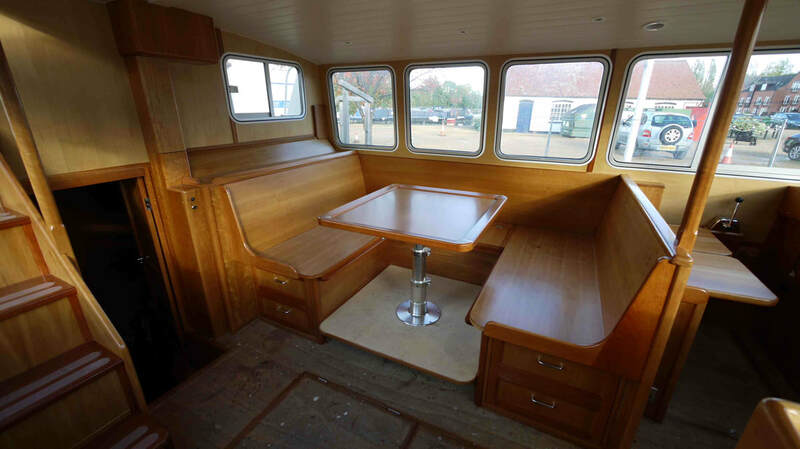 The saloon settee is at a height that offers goods views through the saloon windows. 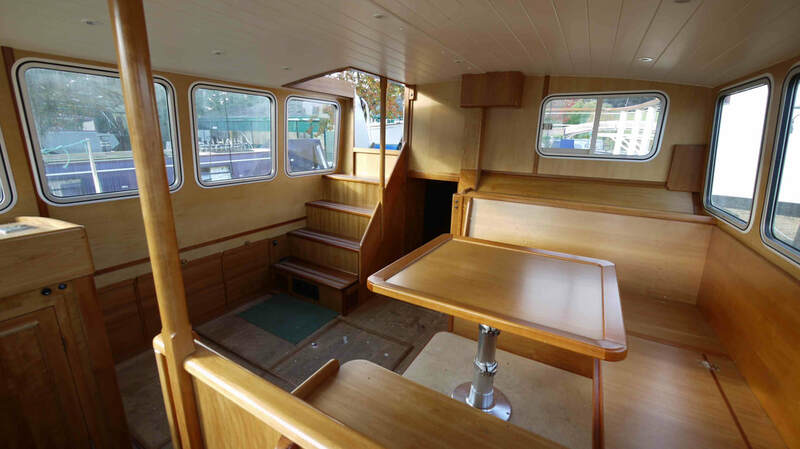 Down steps to the fully equipped galley starboard with fridge, freezer, electric hob, state of the art combination oven with optional alcohol back up hob. Granite worktop. 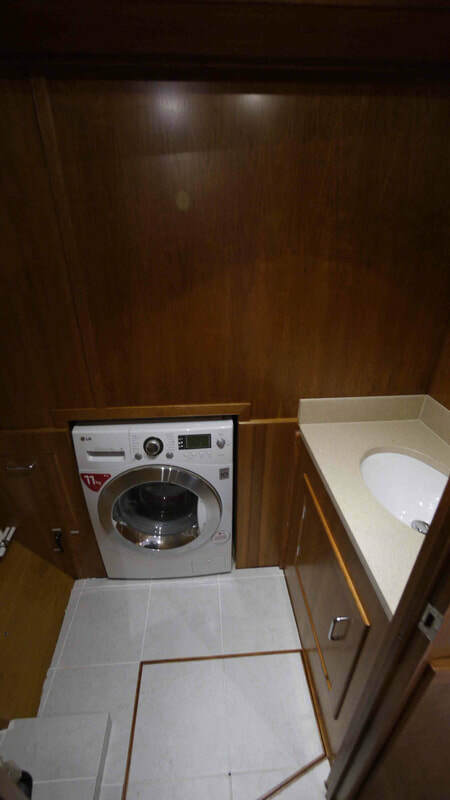 Port side opposite is U shaped dinette which converts to double berth with room for a fold way single berth above. 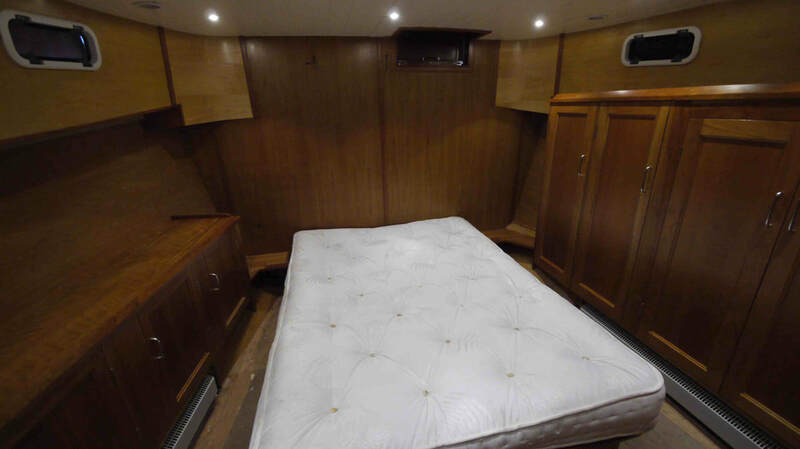 The second double cabin with king sized double bed, storage under and wardrobes and lockers either side. 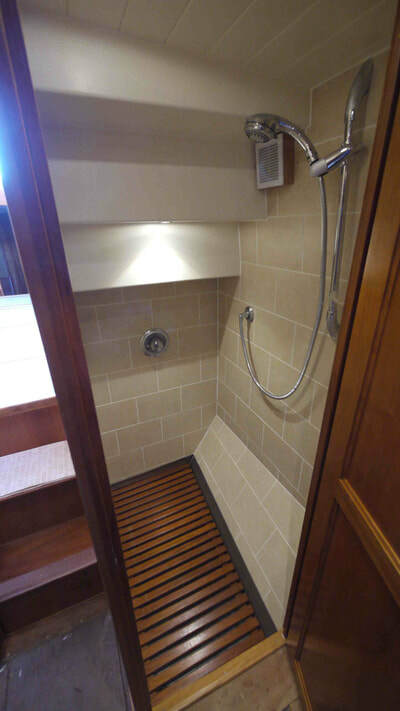 The door through to the second ensuite with large shower cubicle, WC and basin. 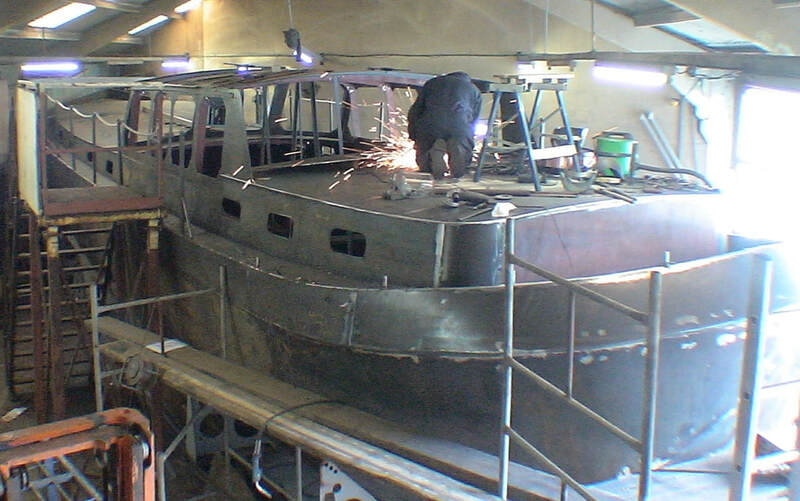 The shell construction of the Huffler 48. 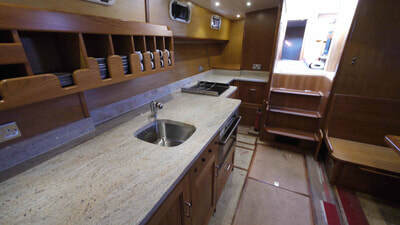 The quality and strength of the construction of the hull, and the attention to detail and choice of equipment in the fitting out, make the Huffler 56 ideal for serious long-term liveaboard cruising. A true, well-found steel motor sailer from a builder with a track record second to none. The internal framing is substantial. Click here for further pictures of the steelwork completed. Timber lathes known as noggins are attached to the substantial steel framing before the insulation is applied. 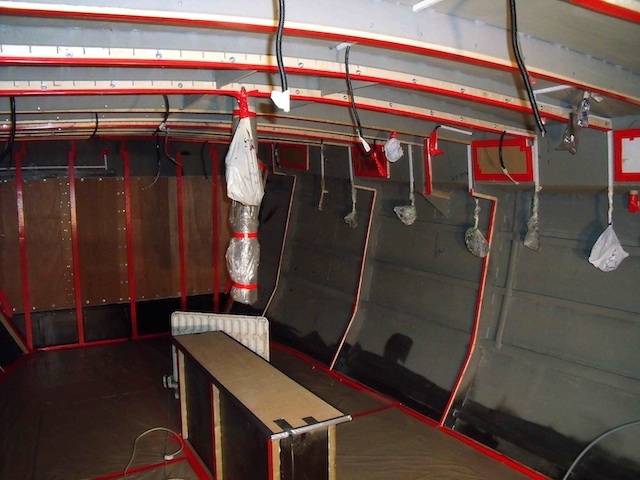 The foam spray insulation encapsulates the steel. 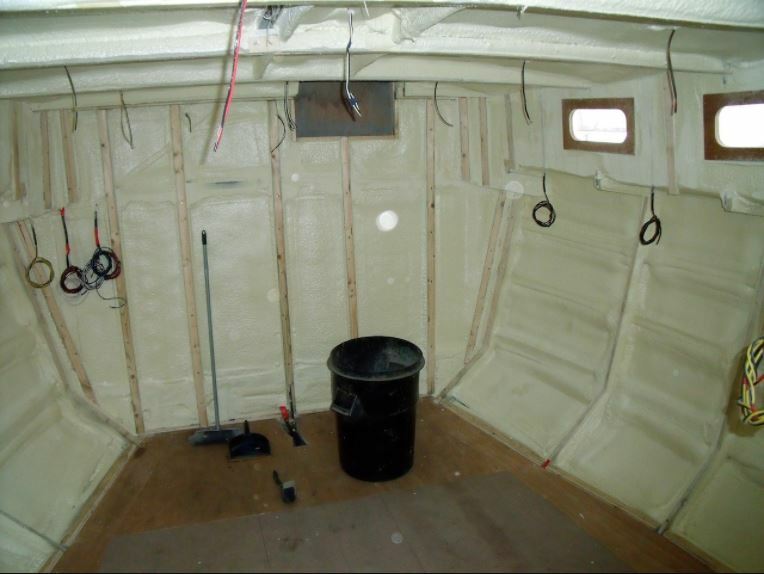 An air space is left between the inner face of the insulation and the back face of the ply lining. The back face of the ply linings are seal. 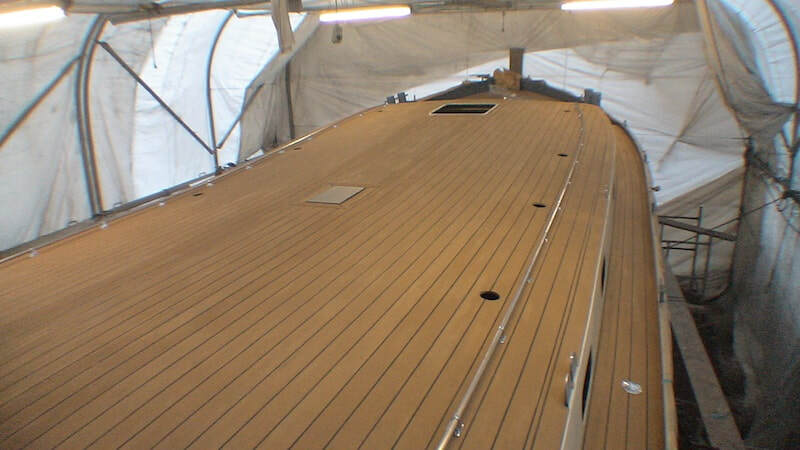 The decks are covered in teak effect material. 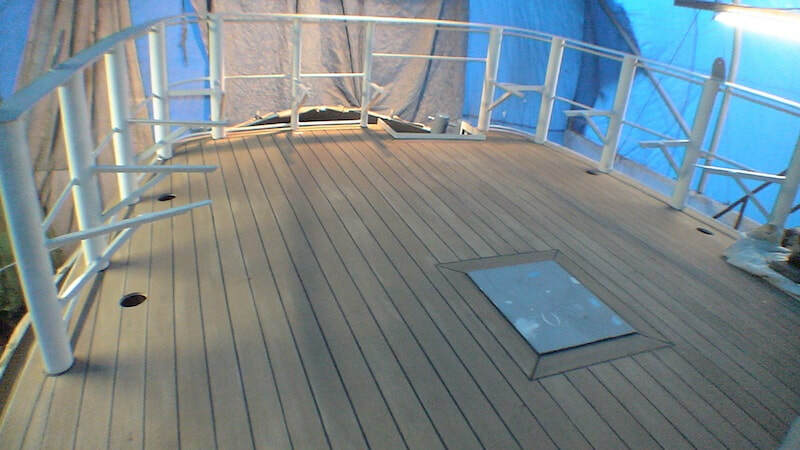 This gives the steel construction the classic decking appearance. 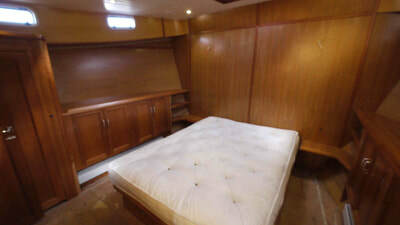 Click here for further pictures. Teak deck layout for the Huffler 48. 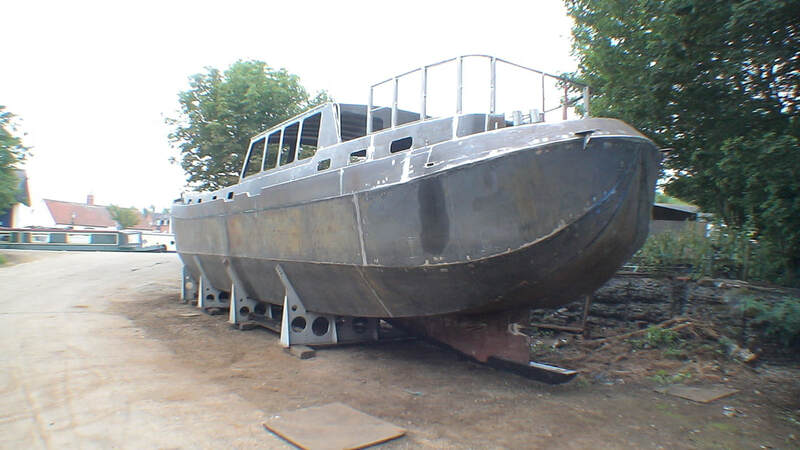 A range of engines 90 hp to 150 hp is offered depending on customers’ requirements. 240 generator is standard as well as a 240 volt supply from inverter charger. The greater part of the boat electrics is 24 volt powered by two alternators on the main engine. 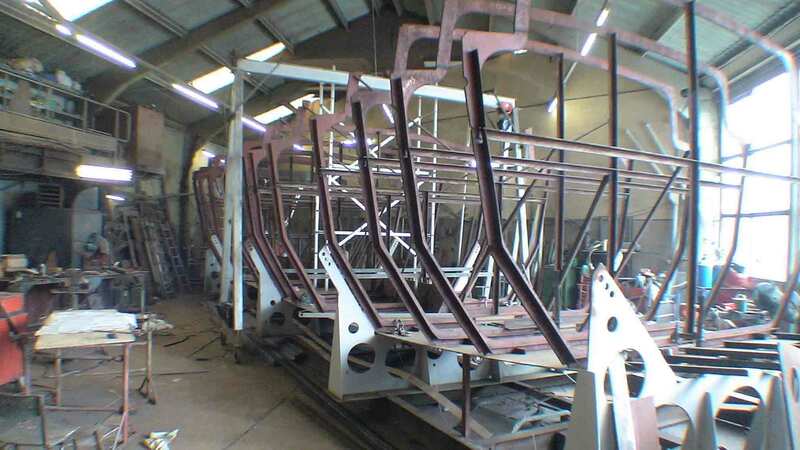 Great emphasis is placed on ease of maintenance with ready access to onboard items where possible. 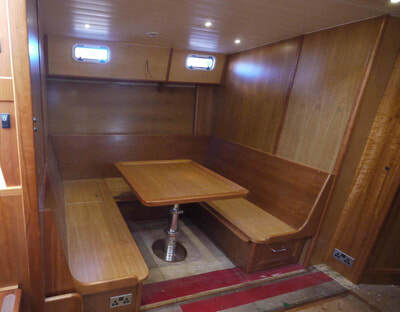 Access to the engine space is via a large hatch in the wheelhouse saloon with a ladder down to a walk around space which includes a workbench with a vice. Diesel marine boiler supplies hot water to panel radiators and to a large calorifier for hot water. 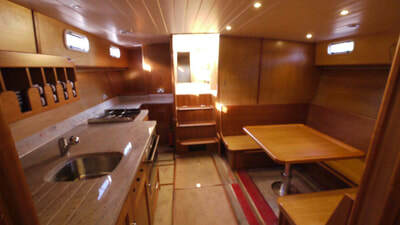 Masts and spar in aluminium, electric genoa winches, Slab reefing with the option of in boom furling. Click here to open the designer Tony Tucker’s website in a new tab. 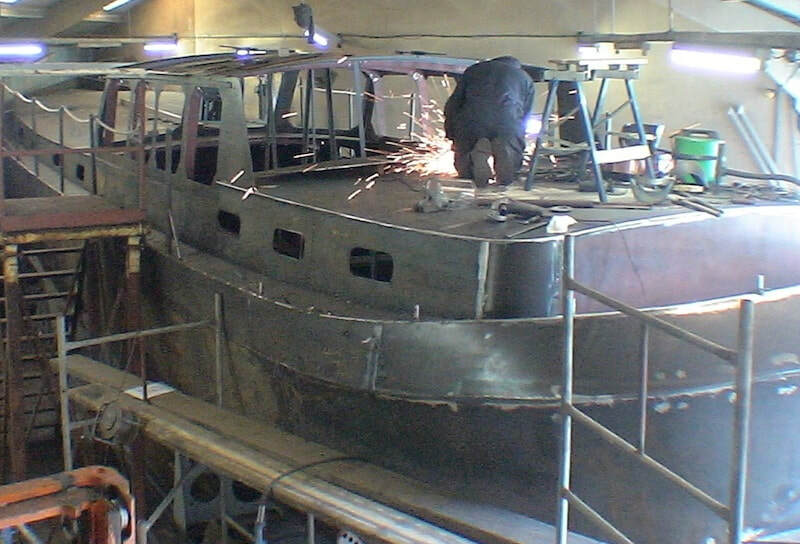 We have a Huffler 56 near completion at the works and you are welcome to make an appointment to view her. 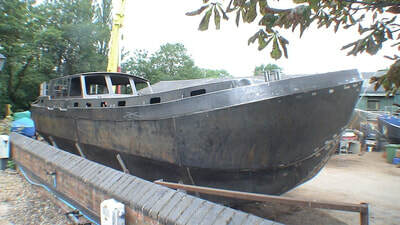 this boat is for sale.